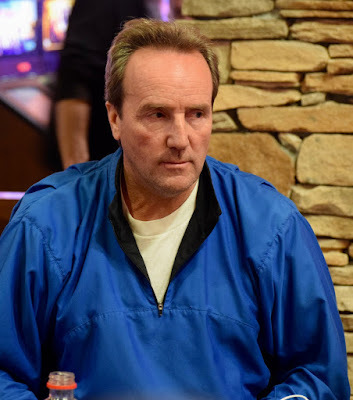 Greg Spartacus Pincombe is down to his last 7BB and in the BB, he moves in with Eight_Ten against the Ace_Queen of Will Chao and not only flops an 8 but adds a Ten on the river for a double. He doesn't finish tacking his chips - 235,000 of them - and Sasha Sabbaghian makes it 42,000 to go. Spartacus - he says that's his real middle name - calls from the SB and verbalizes he might just be doing a stop-n-go. The flop comes out Q-9-8 and sure enough, there go the remaining 190,000 chips. "It was sooted," he says as he chips up some more.